Gene therapy and biotechnology can be used to tackle environmental issues like deforestation and air pollution, while genetic modification in mosquitoes can solve the problems of epidemic diseases such as dengue and malaria, experts said here on Tuesday. “Gene therapy is very promising in solving the problems in curing diseases and genetic disorders that do not have any remedy at present. Genetic modification in mosquitoes can solve the problems of epidemic diseases such as dengue and malaria,” Nabarun Ghosh, a biology professor at West Texas A&M University, said while addressing school students at Science City here. Biotechnology can help in finding out the level of Particulate Matter 2.5 in the air, which is a burning issue in big cities around the world, he said. “I worked in collaboration with another scientist, to make a filterless air purifier that will clean the air and destroy PM 2.5 which is found indoors as well. In 2005 when we started we were targeting MRSA (methicillin-resistant Staphylococcus aureus) bacteria. We used AHPCO Cell (Advanced Hydrated Photocatalytic Oxidation Cell) and we could actually measure the saturation of PM 2.5 using our machine,” said Ghosh. “Initially we thought this only caused pulmonary diseases, but it is entering our whole body. When PM 2.5 crosses the cut-off line, patients die due to heart attacks and other problems like digestion and infection also aggravate,” he added. Researches are being conducted to find out the genetic effect of PM 2.5. “Researchers are trying to identify the effect on the gene due to pollution. 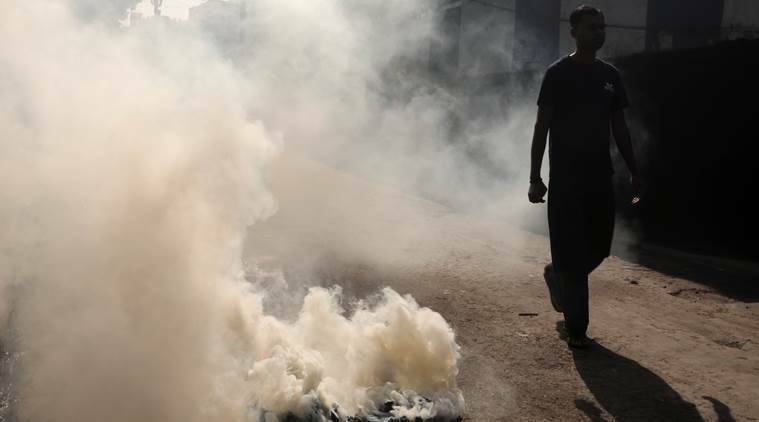 We are doing the medication of the diseases without knowing the exact genetic effect of pollution causing a particular disease,” said city-based doctor PK Banerjee. He said that to treat the patients of the state and know about the genetic effect, they need the data of PM 2.5 level of the entire state, adding that in Kolkata, the US Consulate maintains some data on it, while the West Bengal Pollution Control Board at times has it and, on other occasions, does not. The city’s real-time Air Quality Index recorded in the last 48 hours revealed PM 2.5 level at 154, which is termed as unhealthy for the body. The safe levels of PM2.5 and PM10 are 60 and 100 microgramme/m3 respectively, and anything beyond is considered hazardous for the respiratory system. About Zika Virus, Ghose pointed out how scientists in the US used 25,000 mosquitoes and ran a trial to see if the population of ‘Aedes aegypti’ could be reduced. It was found that the disease-causing mosquitoes were infected with a bacterium called wolbachia, that affects reproductive ability, leading to infertility. “The scientists inserted this bacterium in the male mosquitoes which do not bite. When these males mate with wild females, which do not carry the same strain of wolbachia, the resulting fertilised eggs don’t hatch because the paternal chromosomes do not form properly,” he said. An alumnus of Hare School and Calcutta University, Ghosh, who has worked along with Department of Non-conventional Energy Sources (DNES) on the application of tissue culture technology in crop development, said it can tackle deforestation. “We are planting trees like Dalbergia sissoo, Ashoka tree, Albizia lebbeck, Albizia lebbeck and other fast-growing legumes, growing them quickly using gamma radiation and tissue culture,” he said. Ghosh is also working on an ongoing project in collaboration with Indian scientists trying to analyse the percentage of carbon, nitrogen and sulphur in Triphala and identifying the particular chemical responsible for reducing cancer. “Currently I am also working in collaboration with other scientists on Bitter gourd (Momordica charantia). We have analysed and found that the biochemical of the plant can reduce blood sugar,” he said. Bitter gourd can act as a preventive against diabetes and Triphala against cancer.